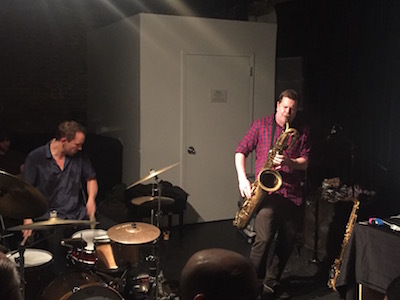 This past month, Ken Vandermark presented a showcase of his recent projects during a week-long residency at the Stone. I was thrilled to be able to catch a few of the sets, including a trio with Matt Maneri and Joe McPhee, the ongoing duos with Nate Wooley and Paal Nilssen-Love (who recently released The Lions Have Eaten One of the Guards), and the quartet Made to Break. Between sets, I took in the well-stocked merch table and realized that the blog had some catching up to do. We begin with the electroacoustic sounds of Made to Break and will continue throughout the week featuring the works of Ken Vandermark.